Present: 41 members as per register. Apologies: Victor, Chris & Lynne. Raffle: Frankie, Chris, Helen, Bruce, Lina. At 10 am on the Sunday after the fourth Thursday of each month. Please bring chairs and food to share. 30 June - Ray, Bullsbrook. Bruce (WOC 23 meeting, 7th April at the Bentley Community Centre). 2. We will need a new secretary in May. 3. Please continue to donate plants for our raffles. 4. ISODW in Albany on the 3rd & 4th of August. Payments for the Bus Trip and the Dinner to be made to our Treasurer. 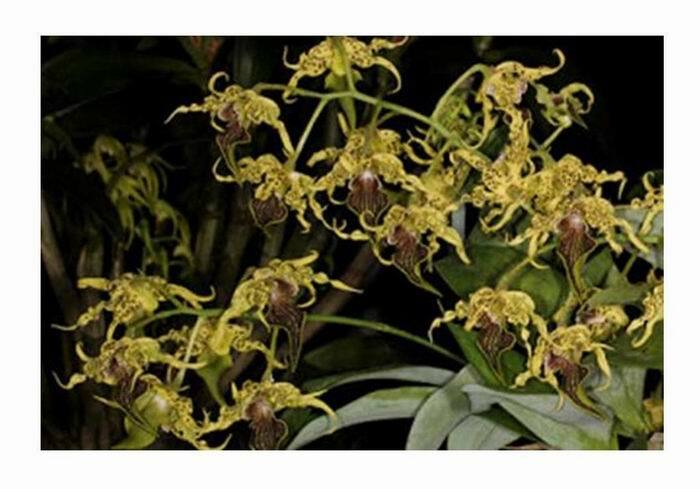 Clive Halls of Beenak Orchids will give two presentations. 5. Orders close tonight for society logo, jackets and shirts. 6. Orchids WA update. A special general meeting is to be held for delegates on the 6th of April. Also negotiations are continuing about biosecurity with Canberra and with the State Minister for Agriculture. 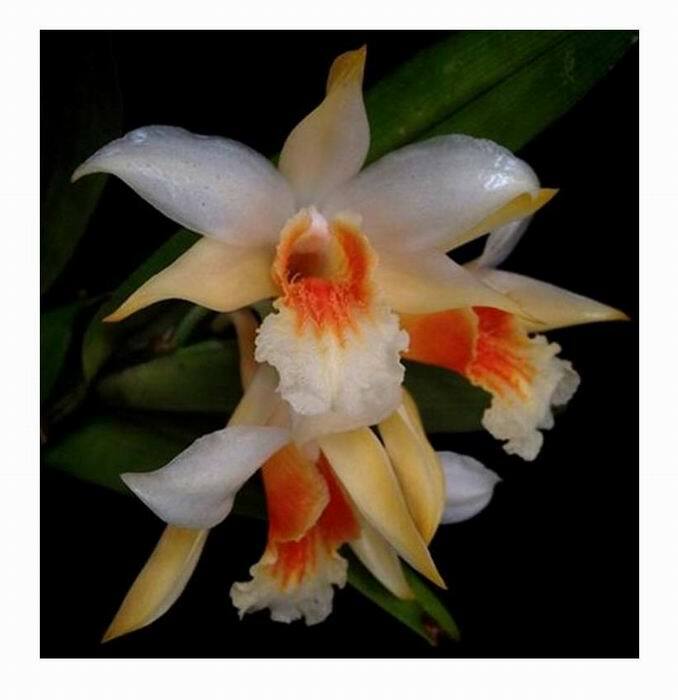 This small sized, hot to cool growing epiphyte is found in Myanmar, Thailand, southwestern China, Laos and Vietnam in remnant forests on tree trunks at 300-1,500m. It has tufted, fusiform, sulcate, shiny purplish brown, stems carrying 1 to 4, subterminal, ligulate or oblong, thick, papery, dull green, acute leaves. 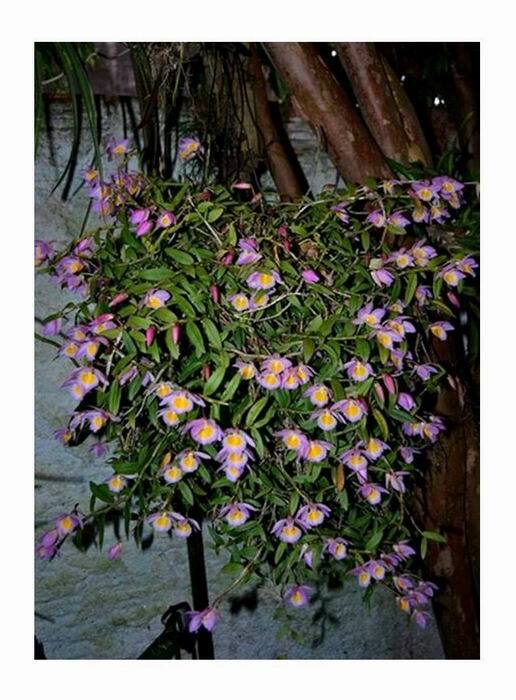 Flowering late winter and early spring, 1-4 waxy, long lasting, fragrant flowers with minute bracts are borne on very short racemes that arise from the nodes near the apex of both leafy and leafless canes. This species has also proven difficult to maintain in cultivation. 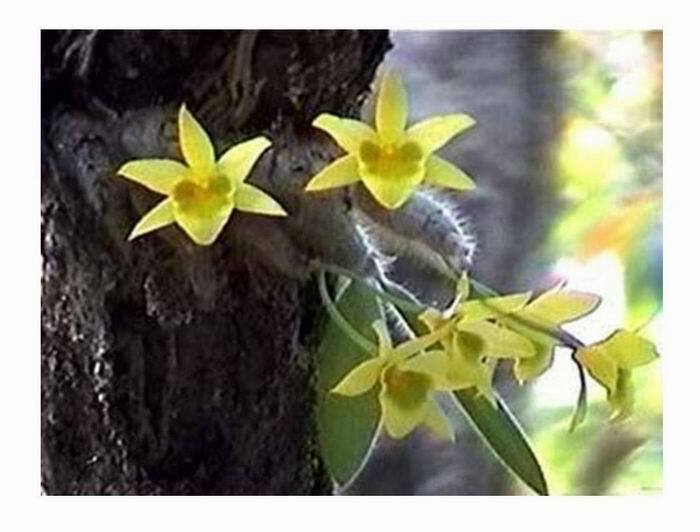 Found as an epiphyte in dense forests on tree trunks at 1,500-2,600 m from China, Myanmar, northern Thailand, northwest India, northern Laos and Vietnam China through Burma and northern Laos, it is another member of the nigro-hirsute (black haired) section of Dendrobium and is noted for its long-lasting flowers. 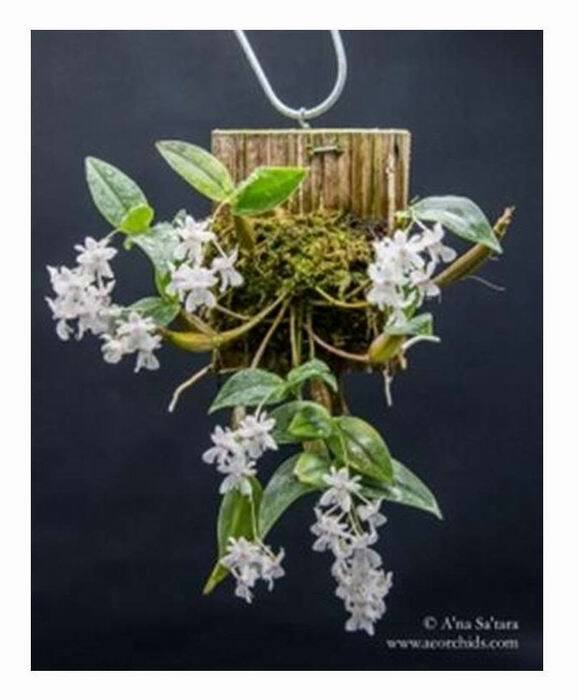 It is a miniature to medium sized, cool to cold growing epiphyte with slender, cylindrical canes carrying 4 to 8, narrowly linear, leathery leaves with the leaf sheaths having fine black hairs. Blooming in the spring on short inflorescences arising near the apex of leafless canes, short racemes carry 2 to 3 flowers. The leafless canes rebloom for several years. 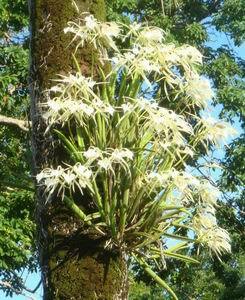 This species is also in the nigro-hirsute group and is found in the Chinese Himalayas, Assam India, Myanmar, Thailand, and Vietnam in forests on tree trunks at 600-1,400m as a small sized, warm to cool growing epiphyte. It has upright, elongate-fusiform, velvety stems that are many leafed towards the apex carrying, oblong or lanceolate, velvety, obscurely bilobed apically leaves with leaf sheaths that are densely covered with black hairs. Flowering in the late winter and early spring, 1-3 waxy, fragrant flowers are borne on very short, black hairy racemes that arise from near the apex of the newest maturing cane. 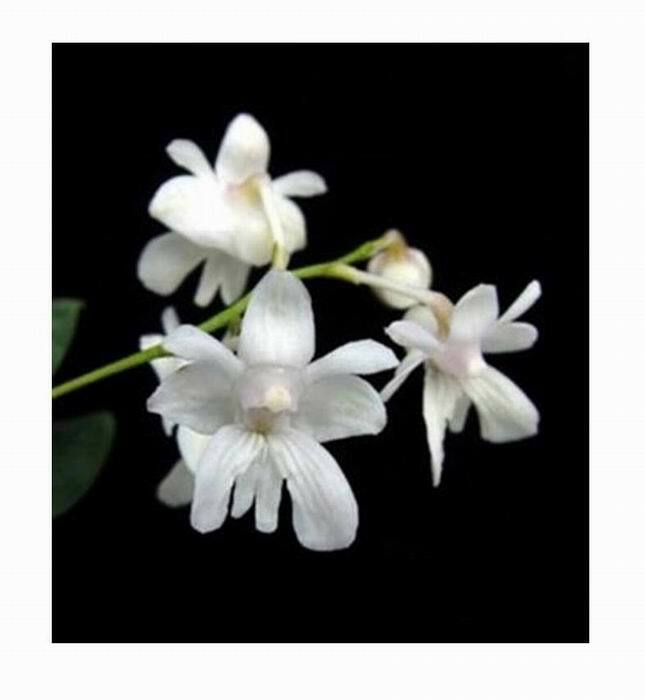 As noted earlier, Dendrobium species in section Formosae have a deserved reputation for being difficult to grow and sustain over the long term in cultivation. However, some growers do not share this experience and it is due to their understanding of the natural environment and habitat from which the species originates. This generally involves a resting period where the species should be kept drier, although this rule does not apply to all species in the section. Generally, this drier period occurs in their natural habitat in winter, so these species need protection from winter rainfall, and will benefit from some warmth as winter in their habitat during local winter will be dry, but not cold and dark as can be experiences in Western Australia. The majority of species in this section are epiphytes, so can be grown in media in pots, or if you are able to maintain humidity in summer, on slab mounts. The media should be able to hold sufficient moisture between watering to prevent the plant from becoming dehydrated, but not stay soggy. Remember, the majority of this section's species are epiphytes and their roots are exposed to air and completely dry between rain periods. You will find that as your plants grow new canes; most often the active roots will be outside the pot in the air. Therefore, if you are growing in a container, the media should allow the free movement of air through the container. Choose a media of consistent size (larger media for species with larger roots, small media for species with very fine roots). If it is part of your orchid culture, you could include perlite or styrofoam/polystyrene to provide air spaces. 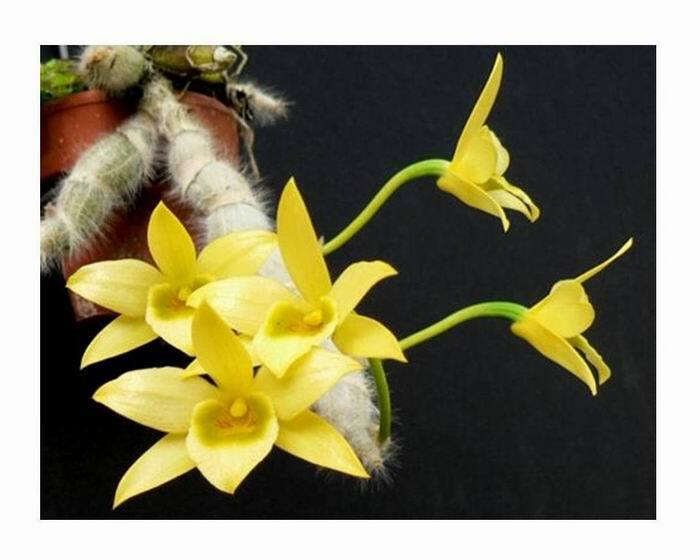 Generally Dendrobium species prefer slightly acid media about pH 6.7. All of this is important as the species in this section are susceptible to root loss if the media breaks down and stays wet, is affected by salt build-up, or is invaded by weeds and/or fungal or bacterial pathogens. This is a mini-miniature to miniature sized, hot to cool growing epiphyte from eastern Papua New Guinea where it grows on tree fern and shady tree trunks in mossy forests at 300-1,900m. It has clustered, spherical to spindle-shaped, purple, olive-yellow or glossy green pseudobulbs with 3 to 4 nodes below oval, leathery, spreading, 2 to 3 apical leaves. Flowering throughout the year, short, wiry, erect or pendant inflorescences arising from the apex of old and new canes carry 2 to 6 white often marked with pink on the column flowers in a cluster. 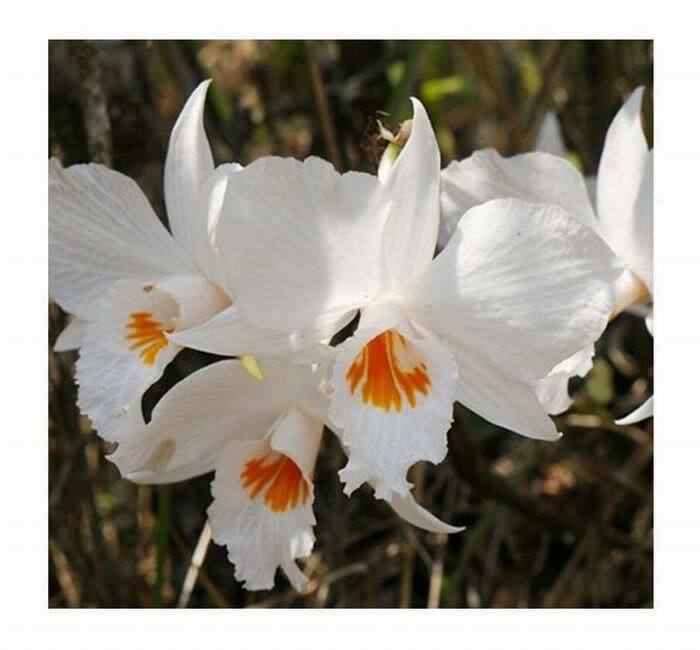 The flowers are long-lasting, are sometimes fragrant and can be produced on very small plants. 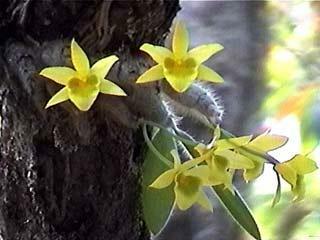 Its common name is the Deviating Dendrobium, and the synonym in use is Sayeria aberrans (Schltr.) Rauschert 1983. 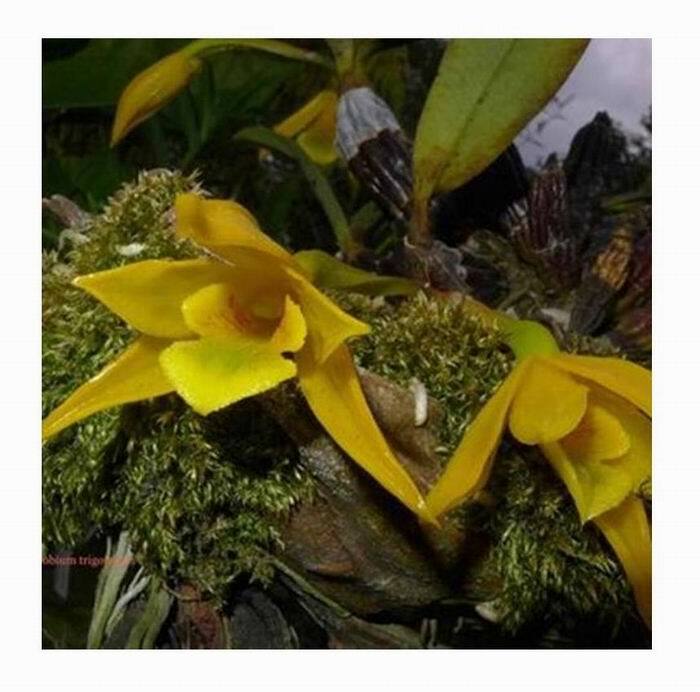 Found in Papua New Guinea as a medium to large sized, cool growing epiphyte on high branches of moss-covered trees in lower montane and cool mist forests at 900-1,200m in high light, exposed positions. Andre Millar says that often she found this species in the highest trees in the forest. The canes carry 2 to 3 apical, elliptic, bluish-green, erect or spreading leaves. Autumn flowering occurs on axillary, racemose, laxly, several flowered inflorescences arising from the nodes at the apex of the pseudobulb. The flowers are predominantly white with heavy spotting on the sepals and petals with a large pronounced lip coloured red and green. 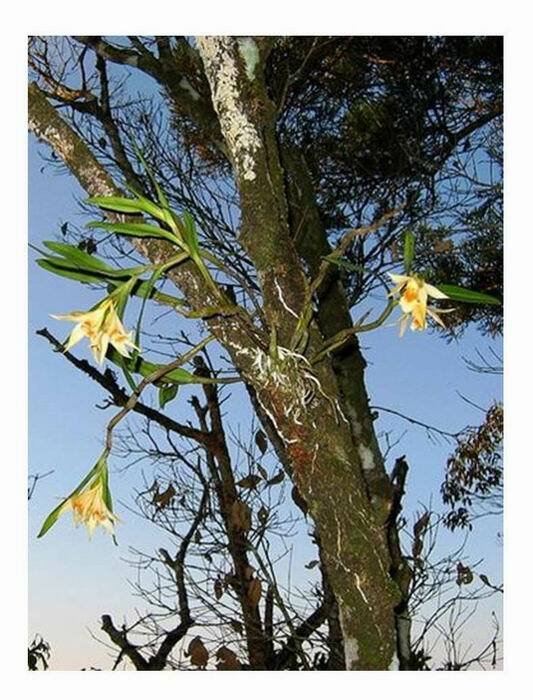 This species was once thought to be lost, or perhaps a hybrid of Dendrobium spectabile, but fortunately, recent rediscovery of substantial populations in some locations has revealed that this is not so. 1. As discussed at our past monthly meetings, we need a volunteer to take on the position of Secretary at our AGM in May. If you want to know more about what is involved, please ask. 2. The next workshop on World Orchid Conference planning will be held at Bentley Community Centre. Nyamup Way, Bentley (just off Manning Road) at 9.00am-12.00noon on Sunday 7th April 2019. Please bring a plate to share for morning tea. 3. 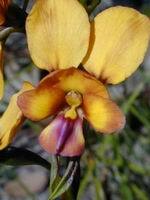 Mt Beenak Orchids will be attending the ISODW in Albany as a vendor and speaker. As August is their busiest month with two major orchid fairs in the Eastern States, Clive will only bring perhaps only 200 plants to sell at the event. To ensure that members are able to get the plants they want, he recommends that we pre-order and he will send the plants to us. As encouragement, he will cover the cost of insecticide and pathogen treatment, and share freight costs. 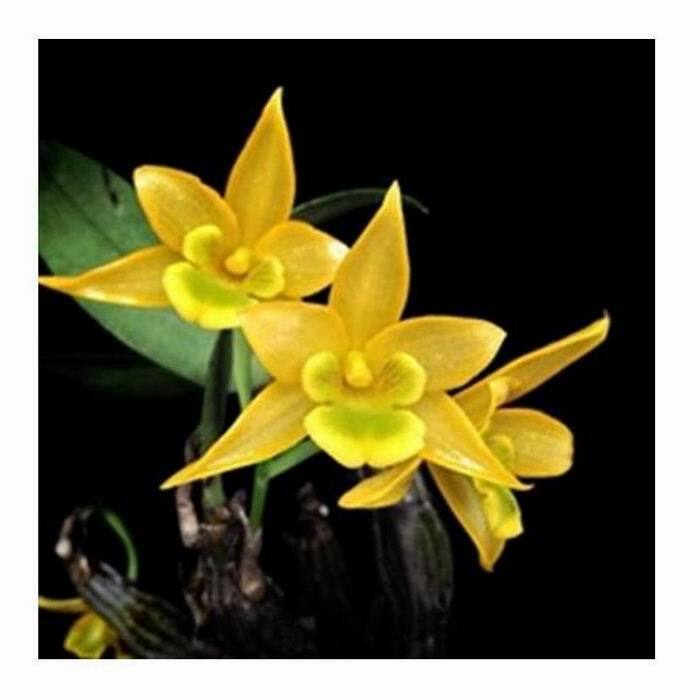 Plants on the list at their website https://mtbeenakorchids.com. are available, although some (particularly species) are in limited quantities. 4. Clive has asked me to get an order to him as soon as possible so that he can send plants before Easter as he will be overseas for a few weeks after then. If you are interested and wish to order, please advise Ken by phone or e-mail. 5. Annual membership renewals were due in February. Please pay the Treasurer. 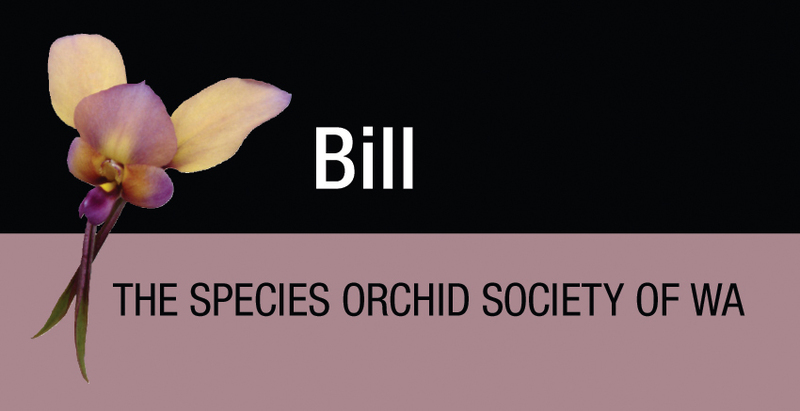 Payment can be made by EFT to the Species Orchid Society account at Bendigo Bank, BSB 633-000 Account number 122491988. Please include your surname in the transfer. 7. If you haven't ordered your new badge yet, please see Mich. The cost for badges with a magnetic clip is $13.50, and with pin is $11.50. Dendrobium loddigesii Rolfe 1887 SECTION Dendrobium is a miniature to small sized, cool growing epiphyte, lithophyte or terrestrial. Thanks to Peter for finding and purchasing these plants on our behalf from several Bunnings stores. It is found in humid, mossy, mixed and coniferous forests at 1,000 - 1,500m. It has tufted, pendant, sub terete, striated, several noded, white sheathed stems carrying alternate, fleshy, oblong, acute leaves and experiences a dry cooler winter and a warmer wet spring and summer. Flowering in Spring, long-lasting, fragrant flowers arise on short single flowered inflorescences at the nodes of leafless canes. Some forms with variegated foliage have been discovered and are now being propagated for commercial sale. It appears that this species was well known in cultivation for many years before its natural occurrence habitat was discovered and it was described and identified. Apparently, it is easily propagated from stem growths. As a small sized species that tends to grow into a mass of plant material, care needs to be taken to ensure that there is plentiful air movement to minimise the risk of scale and mealy bug infestation that might not be readily observable. This species can be grown in a pot, or on a slab mount if you are able to provide humidity in summer. It will require protection from cold winds and winter rain. The benefits of hygienic practice in keeping your collection free of plant diseases. Hygiene tips to keep your orchids disease free.